It’s not too late to get yourself to the Kent Records 25th Anniversary 6TS Soul Revue. 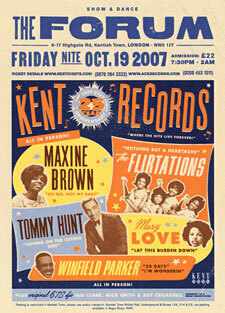 It’s on this Friday October 19th, from 7.30pm – 2am at The Forum, Kentish Town, London with US soul singers Maxine Brown, Tommy Hunt, Mary Love, The Flirtations and Winfield Parker performing in front of a full backing band and celebrity MCs announcing them on stage. The live show will be followed by a three hour Northern Soul disco with original 100 Club DJs Ian Clark, Tony Rounce and Ady Croasdell. You can find out more in our events section and tickets should be available on the night, check the 6TS website for the latest news. Likely to be the biggest and best soul event the capital has seen in a long time, so don’t miss it. Maxine has been singing soul since its very inception. The late music journalist and soul guru Dave Godin considered her self-penned hit ‘All In My Mind’ to be one of the very first soul records and a pinnacle of Deep Soul artistry. Maxine’s most prolific and best loved work was recorded for New York’s Wand label and included the original and best version of Goffin and King’s soul anthem ‘Oh No Not My Baby’, a big hit for Manfred Mann. While at Wand, Maxine cut a string of sublime 60s soul dance tracks that have been adopted by the UK’s Northern Soul crowd. These include ‘One In A Million’, ‘Let Me Give You My Loving’, ‘One Step At A Time’ and ‘It’s Torture’. She continued to record through the 60s and 70s for Sony’s Epic label and Commonwealth United records, but it was not until an appearance at the legendary Cleethorpes Northern Soul weekender in the 90s that she revived her career singing her hits and new material to sell-out crowds around Europe and the USA. Though Tommy has had a hit-studded singing career in the US, he is most famous in this country for his live appearances at Wigan Casino at the height of its popularity in the mid-70s. His live LP recorded there is a classic of the era and he has been a resident of the UK since those heady days. His best known hit here is ‘Loving On The Losing Side’, a Northern Soul recording in 1976 which became a disco smash all around the country. Prior to that he had a massive US R&B hit with his ballad ‘Human’ and he recorded the first version of Bacharach and David’s seminal ‘I Just Don’t Know What To Do With Myself’, a big hit here for Dusty. Tommy is a legend for his fabulous live shows at New York’s Apollo theatre and he is going to treat his UK followers to just such an event at the Forum on the 19th. Mary was the first voice to be heard on the Kent label when her Northern Soul classic ‘You Turned My Bitter Into Sweet’ opened the first side of the "For Dancers Only" LP in 1982. She had a string of classic 60s soul recordings for LA’s Modern label and her ‘Lay This Burden Down’, apart from being a perennial Northern dancefloor filler, has been re-mixed by several inspired soulful house DJs. She continued to record into the 80s and beyond but mainly gospel tracks since the late 70s. One of these, ‘Come Out Of The Sandbox’, was adopted by the Modern Soul crowd at the Southport weekenders and is a soul anthem to their educated ears. Mary has appeared at the Cleethorpes Northern Soul weekender and the Jazz Café before and brings the house down with her magnificent vocals every time. Like Tommy Hunt, the girls came to the UK in the early 70s due to public demand and loved the country so much they stayed for good. Originally known as the Gypsies, they had a big R&B hit with ‘Jerk It’ for the Old Town label and a massive underground Northern Soul hit with ‘It’s A Woman’s World’ for the same label. On moving to the UK they cut a great version of Marvin Gaye’s ‘Little Darling’ for Polydor before recording a string of classic soul singles for the Deram label. Best known among those are ‘Someone Out There’, ‘Need Your Loving’, and ‘Nothing But A Heartache’, which has a massive London club following and was made more famous by featuring in one of the recent KFC adverts. They regularly perform to their legions of fans throughout Europe and have just emerged from the recording studios with a brand new Ian Levine-produced Northern Soul dance track. They are thrilled to be appearing on this prestigious 60s soul revue and will be singing up a storm for their home town crowd who may not even realise they are their fellow citizens. This will be the first visit to the UK for Baltimore, Maryland Deep Soul singer Winfield Parker. He has been singing for local labels in his home city since the early 60s but gained a much bigger following when he started to record out of nearby Philadelphia in the late 60s and 70s. His ballad ‘I’m Wondering’ for Wand Records is considered a Deep Soul classic and his 1971 cover of Edwin Starr’s ‘Stop Her On Sight’ was a 1971 national R&B hit for him. Further records, including the excellent ‘I’m On My Way’ for New York based Spring Records, were critically acclaimed and ‘I Wanna Be With You’ for his own P&L label in 1978 is regarded as a modern soul anthem, so his first appearance in the UK will be a big deal for a lot of soul fans.